In the fight against oral cancer, early detection through oral cancer screenings is imperative. Using the technology of Sapphire oral cancer detection is an effective way to discover oral cancer – when the disease is still highly treatable, and curable. The Dentistry in Naples is a private dental office – we set our standards higher than a typical dental clinic and strive to live up to those standards with each and every patient. We do require an oral cancer screening once every 2 years in our office and use Autoflourescence technology for this service. We feel this service is of great value to our patients’ overall health and well being. The charge for this service is 34 dollars (every two years) As a courtesy we will file this to your insurance company if your specific policy covers this charge. We pride ourselves in offering the best customer service possible to our patients. We care about every aspect of your dental health. If caught early, oral cancer is one of the most curable diseases. An examination using the Sapphire machine is comfortable, and only takes a few minutes. Best of all, it is one of the most accurate methods for detecting cancer early. With proper screening and early diagnosis, the severity of oral cancer drops significantly. Sapphire Plus Lesion Detection is new adjunctive technology that, in addition to a thorough painless visual and physical oral exam, allows your dentist to potentially discover oral lesions early. Without the aid of Sapphire Plus Lesion Detection, cancerous and pre-cancerous lesions could go undetected and possibly spread, causing pain, disfiguration, or death. The earlier these cancerous and pre-cancerous lesions are detected, the greater the chances of successful prevention, treatment and recovery. The graphic above illustrates how the light is able to detect lesions in the area below what the naked eye is able to see. 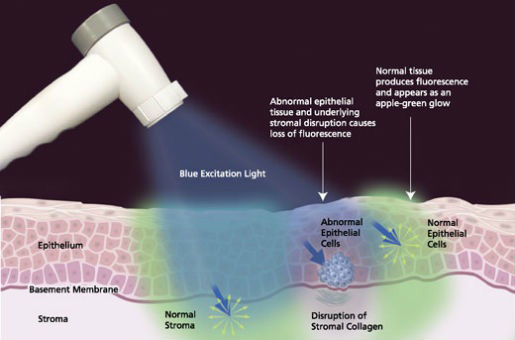 The blue excitation light results in abnormal tissue looking different than regular tissue. Dr. John is not only super pleasant but is an excellent Dentist who can do it all. I have finally found someone whom I can trust and really enjoy. Please know that I am a retired Dentist and, thus, should be a good judge.